"As a gay man, I'm always interested in who tells what story, and how," says Kaufman. 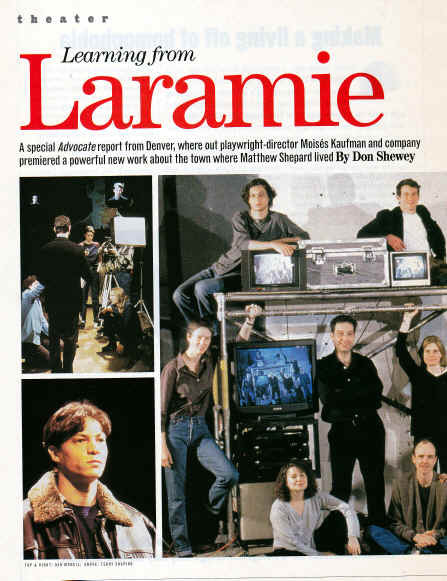 "And I noticed that while the symbolism of Matthew Shepard's death captured the imagination of a lot of people, we weren't hearing very much about how the people in Laramie were talking about it among themselves. That's what I wanted to know." Within a month, Kaufman and ten other members of his Tectonic Theater Project flew to Wyoming and spent a week interviewing people in Laramie. From the media coverage of the brutal event, the New Yorkers had no inkling of what they'd encounter in Wyoming except deranged cowboys bent on killing queers. "I was really frightened driving into Laramie at dusk." says Leigh Fondakowski, an out lesbian Tectonic Theater member.